When Pam Mandel answered my 10 Questions For: Pam Mandel of Nerd’s Eye Views, she mentioned a Fachertorte as one of her most favorite pieces of pastry. Initially I believed she’d made a mistake and accidentally had changed “Sachertorte” into “Fachertorte”. I thought only an American lady could make such mistake, because I as a Vienna Veteran for over 40 years would know of a Fachertorte (actually a Fächertorte) and had never heard of it. I had even posted a photo made by a German lady that I’d found on Flickr of a Sachertorte to go with Pam’s post. The lady in question didn’t like it that I had pinched her photo without asking her on beforehand. She kindly gave me her opinion. So I removed her photo of the Sachertorte just in time before Pam could check the interview….Pam immediately saw my editorial liberty and informed me accordingly. After readjusting the text I would have liked to place a photo of a Fachertorte, but couldn’t find one…. Now I’m happy to be able to present you photos of both pieces of pastry and to clear my own confusion. 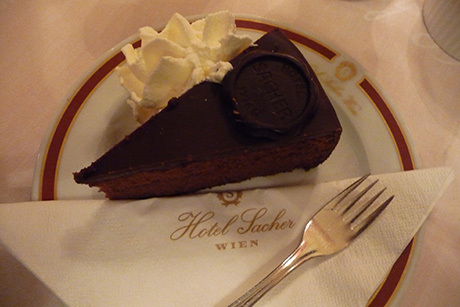 A photo of the original piece of Sachertorte that I enjoyed at the very temple of the Sachertorte, the Hotel Sacher in Vienna (I tasted it on the very table you see on the excellent video here). It is a chocolate cake. It stands apart from all Sachertorte copies, because the cake is not so sweet as the copies. The one apricot jam layer in the cake is very thin. In the copies the apricot jam layer is thicker and sweeter. In addition the original’s jam layer is just under the chocolate icing. Finally the original is quite dry and should be eaten with unsweetened whipped cream. 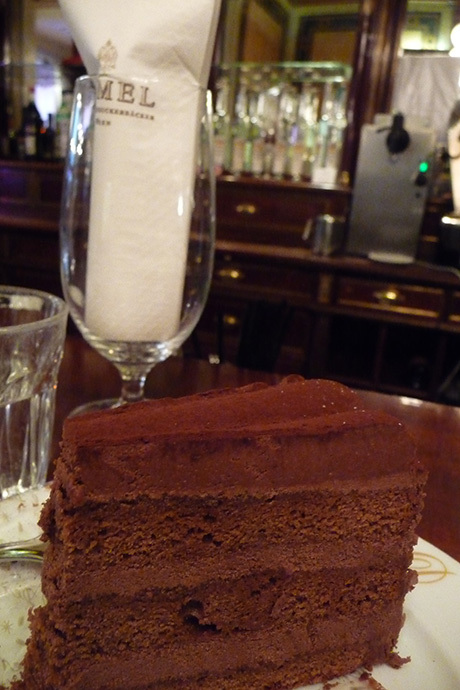 And here the Fächertorte that I enjoyed at the very temple of pastry in Vienna: Demel. As you can see the Fächertorte is a layered (hence the Fächer) piece of pastry with three layers: a poppy seed, a walnut and an apple layer. The Fächertorte is delicious, but I prefer the Sachertorte over the Fächertorte, and the Demel Truffeltorte above both. 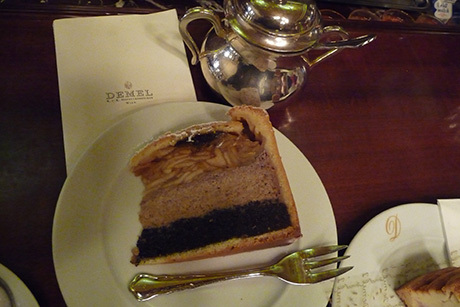 The Demel Truffeltorte is chocolate cake layered with truffle chocolate cream. Yes I had a couple of nice days in Vienna. More to follow. Ah, Guido, you underestimate us Yankees! Plus, if you’d asked, I’d have told you that the best place to get Faechertorte is at either the Gerstner or in the cafe at the KHM on the Ringstrasse. I, too, married an Austrian and as you know, they’re serious about their baked goods, an obsession I embrace. Maybe a little too wholeheartedly. I love that you were inspired to seek out this pastry! You’ve made my day. Someday, we’ll meet to compare cake in Vienna. Yes, Pam, I did underestimate you. 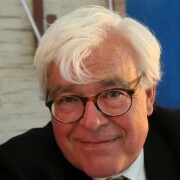 However actually it was more kind of overestimating myself, being married to a half Austrian and not fully realizing you are married to a full Austrian. And you know what? I’ve tested a few Wiener (Vienna Inhabitants) I know, with the question if they knew a Faechertorte and even they had to think hard to come up with the right answer. I kind like these passions for good food. I haven’t visited Gerstner recently, as it seemed a bit worn a couple of years ago. Same happened to Demel, but Demel now is on full speed again since the Do&Co owners acquired them. Of all Konditoreis we presently like the Oberlaa (Heumarket) best. Whatever they’re called, I’d definitely be having a piece of each just for comparison purposes. Really delicious photos. I just wish that you had NOT shown these ones to me. You just woke my hungry monster belly up and it’s wild. Now I might not get any sleep tonight and have to go on a kitchen raid. I’ll blame you when people ask me tomorrow why I look so tired and exhausted. I’ll probably dream about those cakes too. …and I need a bath towel to keep my drooling away from the computer. I wish to go back to Vienna. Now. I was trying to explain this cake to a friend and came across your comments here and the photos on Flickr. I finished baking one last night. And a belated thank you, George!